I was part of a lucky group of people who got to see Flyleaf perform in the WJRR AT&T Listening Lounge on Monday. It wasn’t officially a concert since there were only like 30 people in the lounge, but there was live music being performed and people listening to it, so its close enough to warrant a review. When I first heard about Flyleaf, it was relation to their song “I’m So Sick”, which I was not initially impressed with. It was screamy and got irritating by the 2nd rendition of the chorus. But then I heard more of their music, particularly “All Around Me”, “Cassie”, “Fully Alive” and “Breathe Today”. These are hands down my favorite songs by them and quickly turned me into a fan. At the WJRR session on Monday, they were sharing about their sophomore album, Memento Mori, which is set to be released on November 10. They (lead singer Lacey and guitarist Jared) played two songs from the album: “Again” and “Arise”. They also shared the music videos for the songs “Again” and “Beautiful Bride”. All were fantastic, though ‘Again’ was my hand-down favorite. They answered a few questions from the audience and the radio DJs, then hung around for an autograph/photo session. Overall, it was a great afternoon event. 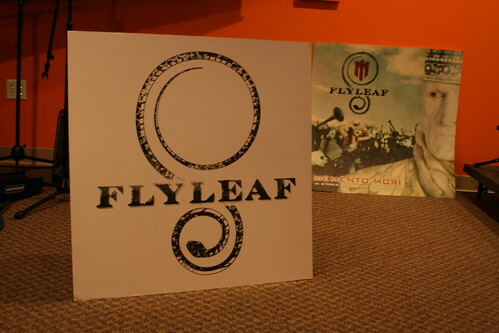 I am really looking forward to Flyleaf’s second studio album and I cannot wait to actually see them in concert sometime!